Geneva – IOM, the UN Migration Agency, reports that 8,407 migrants and refugees entered Europe by sea through seven weeks of 2018. This compares with 12,430 arrivals across the region through the same period last year. 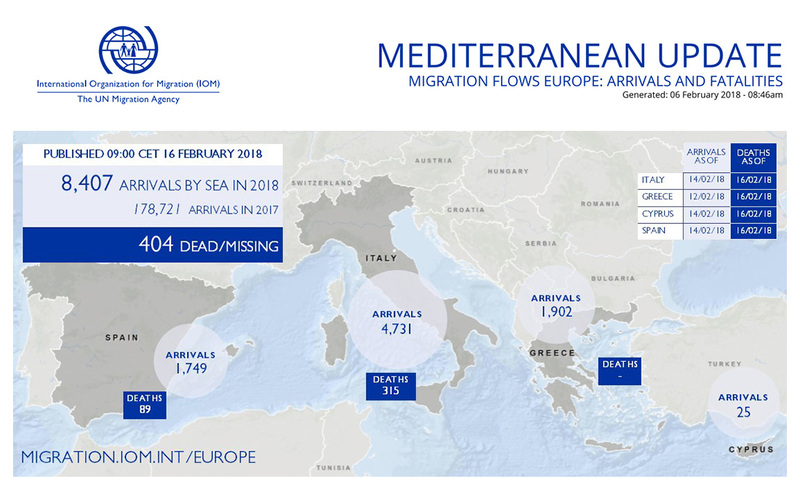 On Thursday (15/02) IOM Rome reported Italy’s official Ministry of Interior figures on registered nationalities of the nearly 4,200 migrants who arrived by sea in January. The leaders this early part of the year have largely come from countries whose arrivals were much fewer a year ago. Eritrea, with 1,184 arrivals registered, accounted for almost 30 per cent of all arrivals last month, while merely 16 Eritreans were registered arriving in all of January 2017. Eritreans were also among the majority of migrants killed or injured this week in a smugglers’ truck crash southeast of Bani Waleed, Libya. Some 180 migrants from Eritrea, Somalia and Ethiopia were identified by IOM personnel after the crash Wednesday. That, plus the rising numbers of Eritreans arriving last month to Italy may be an indication that a nationality whose numbers dropped sharply on this route in 2016 and 2017 may be returning. Tunisians (611 arrivals) were nearly 40 times more numerous than during a similar period last year, while Pakistanis (273 arrivals) were more than 20 times as numerous. Nigerians (212) and Libyans (204) made up the rest of the top five nationalities (see chart below). IOM Greece’s Kelly Namia reported Thursday that over recent days (11-12/02) the Hellenic Coast Guard reported two incidents requiring search and rescue operations off the island of Lesvos and Samos. The Coast Guard rescued 84 migrants and transferred them to these two islands. Another 89 migrants arrived in Kos and Lesvos without assistance. These landings bring to 1,902 all sea arrivals of irregular migrants since January 1, an average of just over 44 persons per day, almost the same average as was recorded at this time last year. These low arrival numbers compare to a rate of around 2,000 per day through mid-February in 2016. IOM Spain’s Ana Dodevska reported that total arrivals at sea in 2018 have reached 1,749 men, women and children who have been rescued in Western Mediterranean waters through 11 February. While arrivals on this western route are even fewer than those IOM is seeing off Greece, the western route is deadlier. No reports of a migrant dying at sea have been reported on the Eastern Mediterranean route in 2018; the remains of 89 men, women and children have been recorded in the waters between North Africa and Spain this year. Most recently, three deaths were recorded in the Western Mediterranean. On 10 February, one body was recovered off Zeralda beach in Algeria, while on 13 February another body was recovered in Sidi Mejdoub, west of Mostaganem. In Spain, the body of a Sub-Saharan man was found near Port of Cabopino, Málaga on 12 February. Since the start of November 2017, the Western Mediterranean has recorded 159 deaths at sea, or about ten per week. IOM researchers note that for the years 2015-2017 – when 35,579 irregular migrants entered Europe by this sea route – the 454 additional migrants whose deaths were recorded represented less than 1.3 per cent of all those attempting this passage. In 2018, the deaths of 89 migrants out of just over 1,800 total voyagers represent a fatality rate of 5 per cent – making passage on these sea lanes about four times as deadly (see chart below). Total deaths in the Mediterranean in 2018 now stand at 404 migrants since the start of 2018, compared with 261 at this time last year. Worldwide, IOM’s Missing Migrants Project has recorded 625 migrant fatalities in 2018 (see chart below). On the Greece-Turkey border, three people died and four went missing after a boat carrying eight migrants and refugees capsized in the river Evros (Meriç or Maritsa) in Turkey’s north-western Edirne province on Monday (12 February). One person managed to reach Greece, while rescue teams recovered three bodies (one woman and two children). In North Africa, at least 19 migrants died and 49 were injured in a truck accident 60 kilometres south-east of Bani Waleed in Libya, a transit location on a much-used migration route through the country to the coast. Around 180 people were crammed into the truck’s cargo containers; 138 of them were Eritrean, while the remaining were Somali and Ethiopian. Of the 19 reported victims, four were children, one was an adult woman and 14 were adult men. On the US/Mexico border, one young man from El Salvador drowned in the Río Bravo near Gustavo Díaz Ordaz, Tamaulipas. His body was recovered by Mexican civil protection authorities on 12 February. The UN Refugee Agency reported that at least six refugees have drowned on Lake Albert as they were escaping conflict in the Democratic Republic of the Congo (DRC) to seek safety in Uganda. On 7 February, two people died at the DRC shores of Lake Albert, where thousands of people are waiting to cross, as some wrangled to get onto the boats. On 11 February, a small canoe carrying four refugees capsized on the lake when it was hit by high waves.